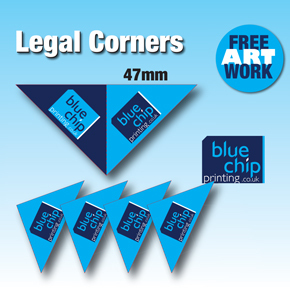 Top best premium printed Legal Corners, with your own logo - simple as that. We produce some of the best Premium bespoke printed Legal Corners - and provide FREE artwork. We offer our standard 47mm version which most legal practices use. Professional Triangular Solicitors / Barristars / Chambers document corners. Our legal corners are printed on our high quality professional presses; Options of 1, 2 or 3 corporate spot Pantone colours, or full colour CMYK; we even offer reverse double sided print if you want the ultimate in Legal Corner prestige, with solid colour print inside. Our legal corners are pre-creased, ready to use; Options of Gloss, Matt, or Premium Anti Scratch Satin laminate finishes. Click the image above right to go to our detailed web page, prices & to place your order. We are more than happy to set your artwork up at no extra cost, free of charge, if you can supply us with a high resolution copy (.pdf or EPS) of your logo, and let us know what else you want included on your legal corners. Samples of our various available finishing options on request - please email us - click here with your details. These are the best legal corners you can buy or purchase in the UK, based from the reviews we have received. All our prices on document corners include *Free delivery to one Mainland UK address. We've used lots of different companies at varying prices and these are by far and away the best we've had! Very helpful online team particularly with the artwork production.. Really pleased with the finished product and the quality of the finish. I cannot recommend this company enough - these are by far the best legal corners I have purchased in many years. Jeremy could not do enough to assist throughout. Very pleased with first order, good quality and efficient turn around. Will be back for more - highly recommended! My first order very impressed with the service from start to finish and it won't be my last order! The corners were top quality Great job. Thank you!